I know what you are thinking, and you have a dirty mind. I will have you know that in this house, monkey nuts are not what you think they are, they are peanuts. And it is all Cathy MacLennan’s fault. She is the author of two of Kat’s favorite picture books, Monkey, Monkey, Monkey and Chicky Chicky Chook Chook. In her book, Monkey, Monkey, Monkey, a little baby monkey gets hungry and goes in search of his favorite food–monkey nuts. And it turns out monkey nuts are peanuts, but monkey nuts is more fun to say, and it fits the rhyme and rhythm of the story better, so monkey nuts they are. So now you know why we call peanuts monkey nuts at our house. Which also explains the name of these cookies–they have peanuts, I mean, monkey nuts in them. I actually came up with them as something for Kat and I to make together and as a vehicle to get her to eat more different dried fruits, more peanuts, I mean monkey nuts, and oats. I used white whole wheat flour for these cookies and ended up putting dried sour cherries, golden raisins and dried cranberries in the dough along with the peanuts. I could have used half butter and half peanut butter in the dough, but I was running low on peanut butter so I didn’t bother with it. But next time I make them, that is what I will do. What were the results of my cookie baking experiment with Kat? Well, she loved helping to bake the cookies. She helped measure spices, fruits, oats, nuts and salt, and dumped stuff into the mixer bowl and helped crush up the peanuts a little bit with the mortar and pestle. Then she helped scoop cookie dough onto the baking sheets. We knew that she already loved dried cherries, but we discovered that she also likes golden raisins and dried cranberries. And she liked the resulting cookies as well, so I am pleased with the outcome. 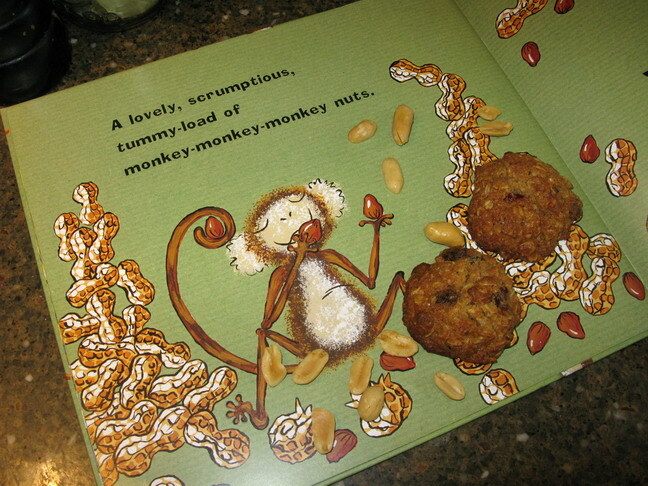 So, Fruity Monkey Nut Cookies were a success which shall be repeated in the future. Now, Kat is already excited about making a batch of cookies to take to Great Grandpa before we go visit him in Baltimore later this month! I love teaching kids about food and cooking! Line cookie sheets with silapats or parchment paper. Mix together flour, salt, baking soda and ground spices. With an electric mixer, cream together butter (and peanut butter, if you are using it) and sugar until it is fluffy. Add honey and vanilla extract and beat until creamy. Add eggs and beat until well combined. Add flour to bowl and, scraping down sides as necessary, mix it thoroughly in with butter mixture. Add the oats, fruits and nuts, and combine on low speed, scraping down bowl and beater as necessary. Allow to cool on the sheet for about a minute before removing cookies to a wire rack to finish cooling. Note: Other healthy additions you could make to these cookies–chopped up dried apples, flax seeds or flax seed meal, roasted unsalted sunflower seeds, or you could use soy nuts and soy nut butter instead of the peanuts, I mean, monkey nuts. Heh. In the UK ‘monkey nuts’ is a fairly common term for whole unshelled peanuts. I didn’t realise it wasn’t common parlance across the pond! Oh, that is cool! I had no idea, Ladylark. That makes sense as the author of the book was born in Africa, but now lives in the UK. “monkey nuts” is a pretty common term in india too. That makes sense, since India was a British colony until fairly recently. So was the US, of course, but apparently we tossed the Brits out long before “monkey nuts” was common parlance, so we just call them plain old peanuts. Interesting the way slang develops….